28 How terrible it will be for the city of Samaria! It sits on a hill like a crown of flowers. 3 That city is like a crown. It’s like a crown of flowers whose glorious beauty is fading away. But it will become like a fig that is ripe before harvest. he picks it and swallows it. 15 You brag, “We have entered into a covenant with death. The one who trusts in that stone will never be shaken. The agreement you made with the grave will not stand. Cummin seeds are beaten out with a stick. But he doesn’t let the horses grind it to dust. 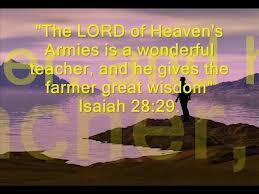 29 All of those insights come from the Lord who rules over all.